Oxford university professor Frank Close tells us the real story of antimatter. What it is, how it was discovered, how it is created and more importantly, perhaps, what use if any can be made of it. Stuart Barlow helps us through Close’s whistle-stop tour of something which is largely defined by what it is not. In one of those strange coincidences, Close’s book has been published at the same time as the new Star Trek film – the antimatter warp drive engine which powers the Starship Enterprise is the stuff of science fiction. And there’s also Angels and Demons, which opens in the cinemas today. The new mystery thriller, based on Dan Brown’s latest book, starring Tom Hanks and Ewan McGregor revolves around the murder of a physicist working with antimatter. Antimatter is not a big book – it is only 150 pages long – but it is packed full of theories and concepts which need perseverance to fully grasp their full meanings. Close takes us into the world of sub-atomic particles, where swirling electric and magnetic forces bind electrons, protons and nuclei, which then form into us and the world in which we live. He points out that these atoms have existed for billions of years, formed out of the Big Bang in a battle between matter and antimatter at the beginning of time. As Close observes philosophically, while we “breathe in oxygen, exhale carbon dioxide, grow old and die, … our atoms will go on”. Yet if matter comes into contact with antimatter, both will be annihilated in an explosive flash of radiation. To clarify what antimatter is and where it comes from, there is an explanation of how Einstein’s recognition that even a stationary object contains energy locked within its atoms. Close describes this as “congealed energy” and shows its profound implications on our understanding of the nature of energy and that matter was created at the start of time. He then describes how the concept of antimatter developed out of the union of the Theories of Relativity and Quantum Mechanics, when Paul Dirac created his mathematical formula in The Principles of Quantum Mechanics (1930). This explained the behaviour of electrons which predicted the existence of the simplest particle of antimatter (the positron – the anti particle of the electron). You need to give this part of the book your complete attention to fully understand the theoretical justification of antimatter, before reading how theory turned into practice as Close describes how the first positrons were discovered from gamma rays colliding into atoms and the continuing discovery of weird particles with fanciful names over the last 70 years. Close concludes by reviewing some ‘practical’ uses of antimatter. Thankfully, despite the military establishment’s eyes lighting up at the explosive potential of antimatter – half of one gram of antimatter would create an explosion equal to the nuclear bomb at Hiroshima – Close points out that at current rates of production, it would take a hundred million years to produce a single gram of antimatter, at a cost of US$1,000 trillion! Sadly for Trekkies this also means we will not be seeing any antimatter warp drives soon – despite the fact that a gram of antimatter contains the same energy as the fuel for two dozen space shuttles. Yet, as Close points out, we do benefit from the existence of antimatter in two very different ways. The atomic nuclei of some elements have been found to be ‘positron emitters’, with positrons flying out of these atoms until they bump into electrons in other atoms. The resulting flashes of gamma rays are exploited in PET (Positron Emission Tomography) scanners to create 3D pictures from inside our bodies to allow medical diagnosis to be carried out. Then at the heart of the Sun, positrons constantly collide with electrons, being instantly destroyed and turned into gamma rays to provide us with daylight. From annihilation comes the very stuff of life. When you create antimatter together with its matter counterpart, you have to put in the same energy as would be released were they to annihilate one another. You do not get matter from nothing. 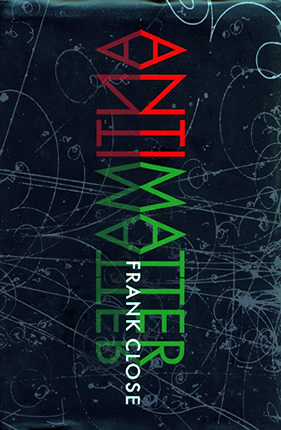 Antimatter, by Frank Close, is published by Oxford University Press at £9.99.